2 9 SHUTTERSTOCK w w w. s p i r i t o f w o m e n . c o m S U M M E R 2 015 S P I R I T O F W O M E N S H A R I N G H E A L T H S E C R E T S S h a r i n g Secrets HEALTH To send a health question to "Sharing Health Secrets," please e-mail plawrence@spiritofwomen.com or write to Sharing Health Secrets, Spirit of Women, 2424 North Federal Highway, Suite 100, Boca Raton, FL 33431. The idea that plain carbonated beverages can cause weakening in the bones and teeth is one of the latest Internet rumors making the rounds, but there's no evidence that it's true. In fact, the International Osteoporosis Foundation (IOF) says that while colas and energy drinks may contain ingredients that can negatively impact your stores of calcium, carbonation itself is not the culprit. "Many commercial mineral waters are carbonated, and some are rich in calcium and other minerals—as well as being free of calories," according to the IOF. These calcium- rich beverages can actually be benefcial if you're not getting enough calcium in your diet. 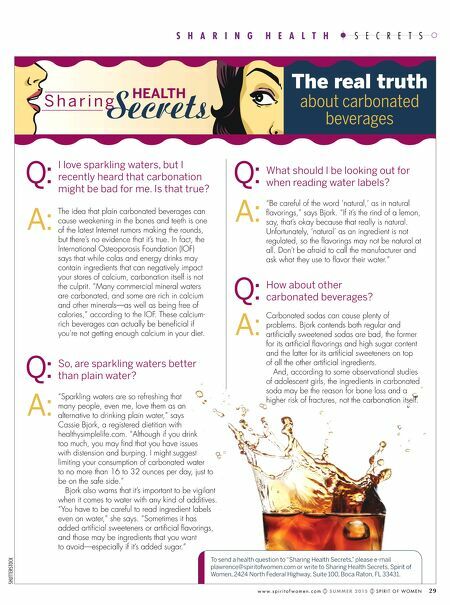 A: The real truth about carbonated beverages I love sparkling waters, but I recently heard that carbonation might be bad for me. Is that true? Q: A: Q: What should I be looking out for when reading water labels? "Be careful of the word 'natural,' as in natural favorings," says Bjork. "If it's the rind of a lemon, say, that's okay because that really is natural. Unfortunately, 'natural' as an ingredient is not regulated, so the favorings may not be natural at all. Don't be afraid to call the manufacturer and ask what they use to favor their water." A: Q: How about other carbonated beverages? Carbonated sodas can cause plenty of problems. Bjork contends both regular and artifcially sweetened sodas are bad, the former for its artifcial favorings and high sugar content and the latter for its artifcial sweeteners on top of all the other artifcial ingredients. And, according to some observational studies of adolescent girls, the ingredients in carbonated soda may be the reason for bone loss and a higher risk of fractures, not the carbonation itself. A: Q: So, are sparkling waters better than plain water? "Sparkling waters are so refreshing that many people, even me, love them as an alternative to drinking plain water," says Cassie Bjork, a registered dietitian with healthysimplelife.com. "Although if you drink too much, you may fnd that you have issues with distension and burping. 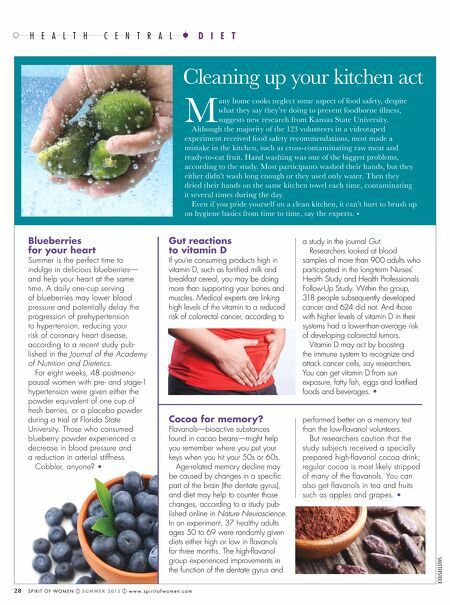 I might suggest limiting your consumption of carbonated water to no more than 16 to 32 ounces per day, just to be on the safe side." Bjork also warns that it's important to be vigilant when it comes to water with any kind of additives. "You have to be careful to read ingredient labels even on water," she says. "Sometimes it has added artifcial sweeteners or artifcial favorings, and those may be ingredients that you want to avoid—especially if it's added sugar."